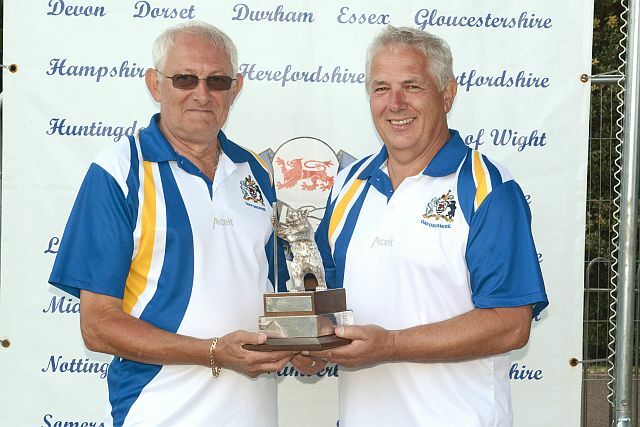 The Friends of English Bowling 2 Wood pairs took place today during the National Championships at Leamington Spa. 30 pairs took part. The morning was overcast but the afternoon was hot and sunny. 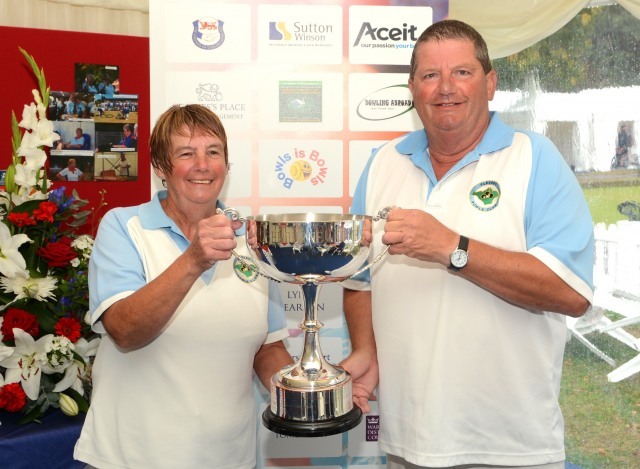 Last year’s winners (Ken Eichen and Frank Barrett) were beaten in the first round by last year’s runners up (Jenny Ralph and Jackie Bryant of Bedfordshire) who went on to contest the SF against Terri Keen (Bucks) and Rosemary Ellman-Brown (Sussex) winning 10-5. The other SF was contested between Margaret and Mike Morris (Oxfordshire) and Alan Hill and Stephen Hemsley (Lancashire). The Morris’s winning 17-5. 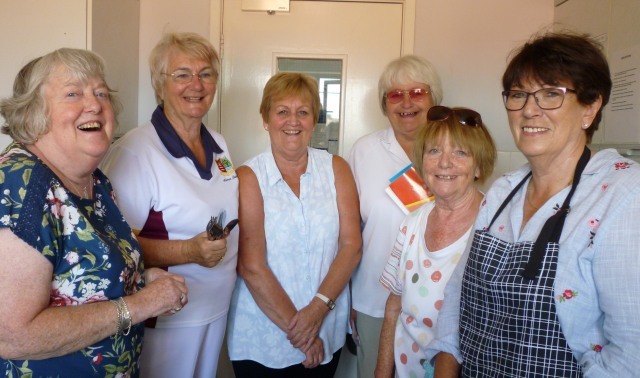 The final was a very close game involving an extra end of 1 bowl per player with Margaret and Mike winning 13-12.
the buffet there was a raffle in aid of Disability Bowls. 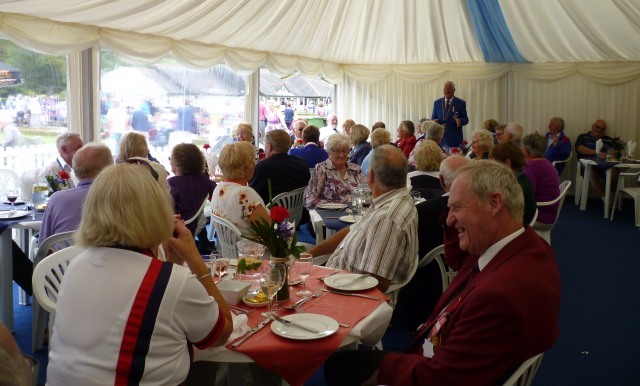 On Tuesday August 7th on a very hot and sunny day; the first of the four ‘Buffet Lunches’ with the Presidential Team took place in the hospitality tent. The Friends had no idea what to expect as we had all been used to going to the Naval Club (which has now closed). If you have not been to lunch yet, then you are in for a very big surprise. From the moment you are greeted at the door by two members of the Friends (one acting as bouncer and one to sign you in). You are then offered a drink and you meet the members of the Presidential Team. On this occasion it was President Bill and JVP Paul in attendance. 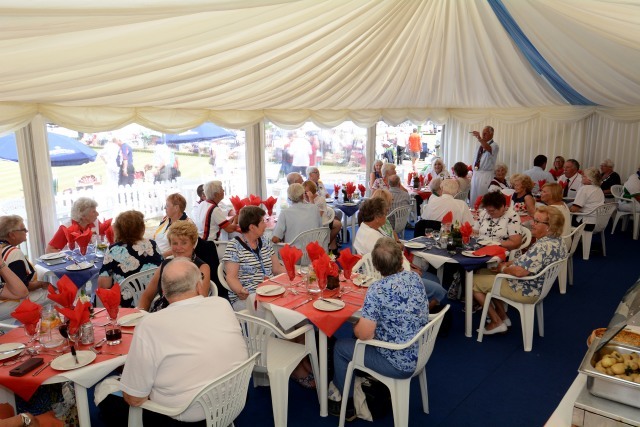 You then have a chance to circulate and catch up with old friends – or new ones – in the ‘gardens’ outside the tent, where there are plenty of tables, chairs and umbrellas, or you could sit down, drink in hand and watch the excellent bowling on A green, if you just wanted to chill out for half an hour. At 12.30 everyone is called in for lunch. 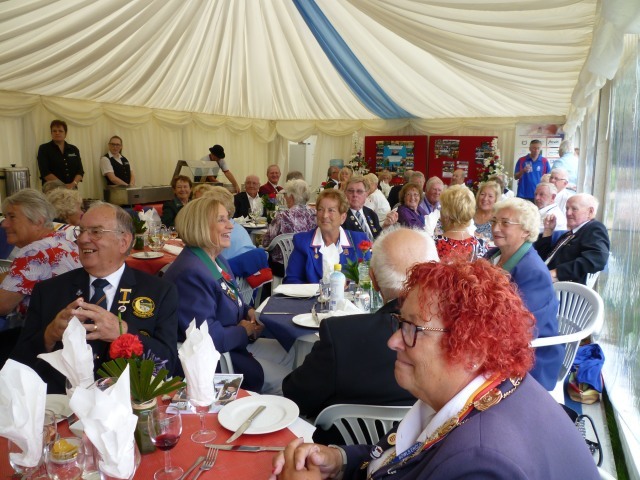 What a lovely surprise – there are tables of four laid up with red cloths, flowers and place settings, with seats for all. We were expecting to see the finger buffet laid out and tables and chairs to sit on (if you were lucky enough to find one). We were then treated to an excellent 5 star meal. lots of choices and some yummy deserts. Most of us having seconds – and some thirds. The wine was flowing and the lovely Tony (not Allcock) was rushing round filling up the glasses before they could get emptied. Congratulations to Richard and his team for doing such a superb catering job. Some of you might remember Richard from the Naval Club as he was the chef the first year we used it. (I knew he looked familiar). 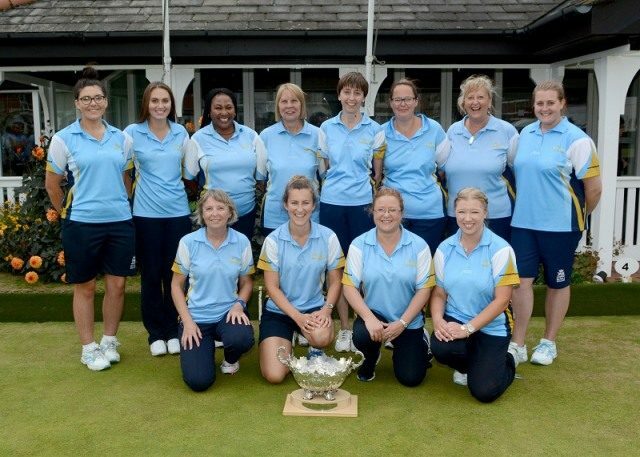 Congratulations must go to Penny and Bowls England for doing us proud. It was a challenge for them and they faced it head on and did a wonderful job. Everyone wondered how it was going to work out and all I can say is if you did not get a ticket to one of the lunches then try and score one on the black market. 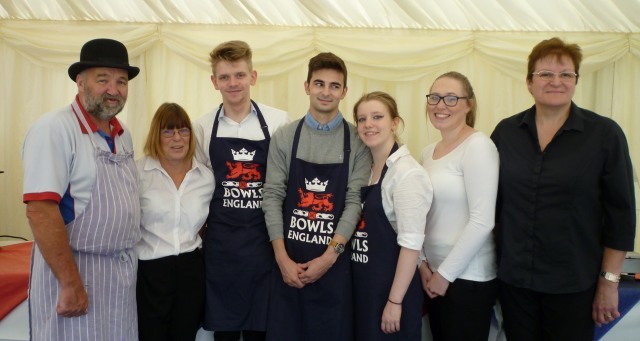 Bowls England does have one very big problem – 350 members and only four dates for the lunches. 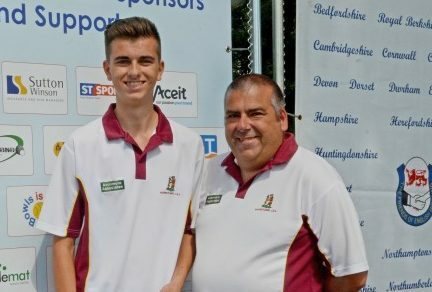 Once again it is time for the Nationals at Leamington Spa. Apart from the first aid tent we also support quite a few of the competitions. Bob Saunders is good enough to let me choose the pictures I want to put on the site, for which I am very grateful. 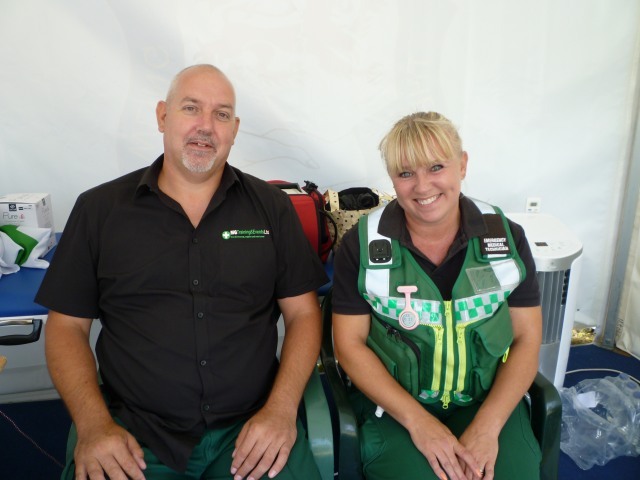 Always in attendance is Martin, our onsite Medical Team and this year he has the lovely Sally to assist. Hopefully they will not be needed and can have a restful few weeks. 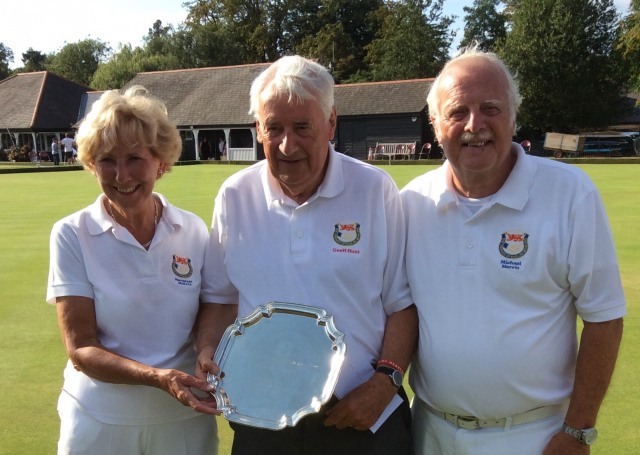 On the first weekend the Middleton Cup and the John’s Trophy take place and Geoff Hunt (the Chairman of Friends) and his lovely wife Jan presented the cheques to the winners. 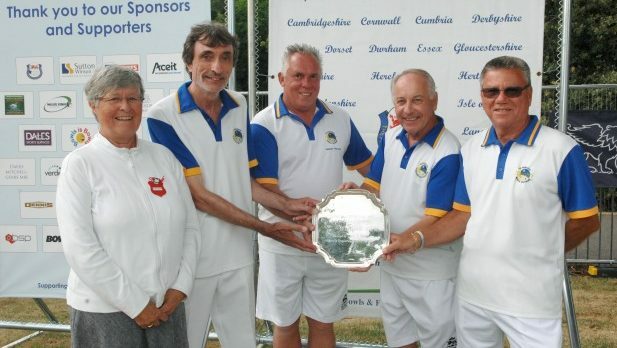 The winners of the Senior 4s. Royal Wootton Bassett. 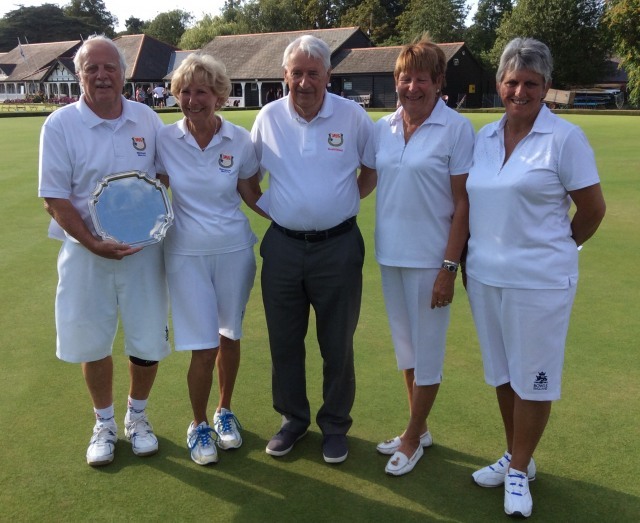 It was so nice to see them win as earlier in the year the Friends had joined them to celebrate 90 glorious years. 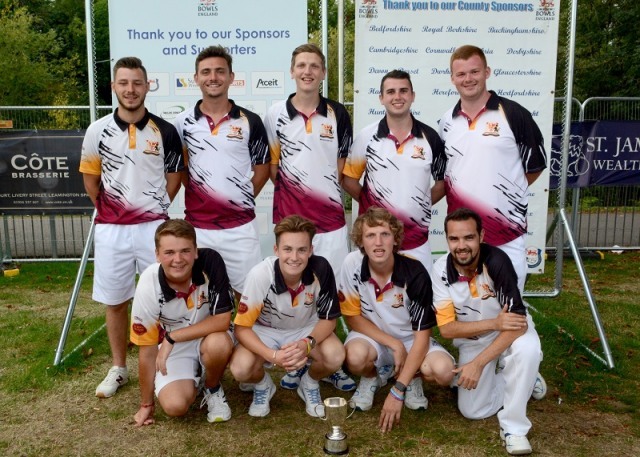 The Friends v Cambridge Park B.C. What a lovely day yesterday at Cambridge Park. 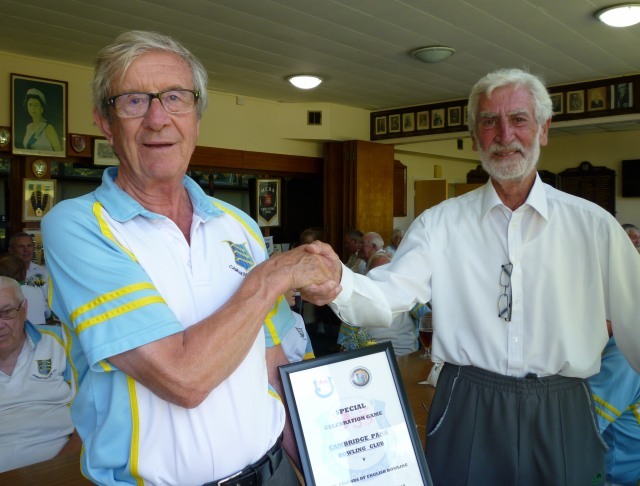 The Friends from ten Counties had travelled to play in the match and received a very warm welcome from captain Norman and President Nadine – too warm for some! 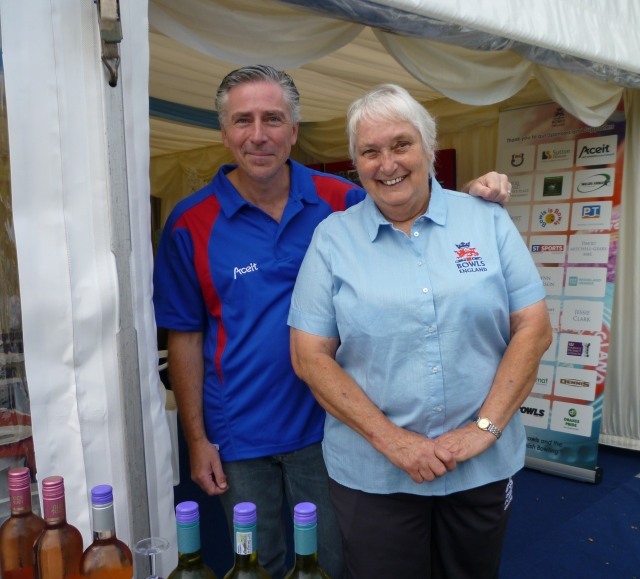 It was particularly pleasing for Jane and I to meet so many of our old clubmates. Thanks to FEB for asking me to be çaptain of the day. 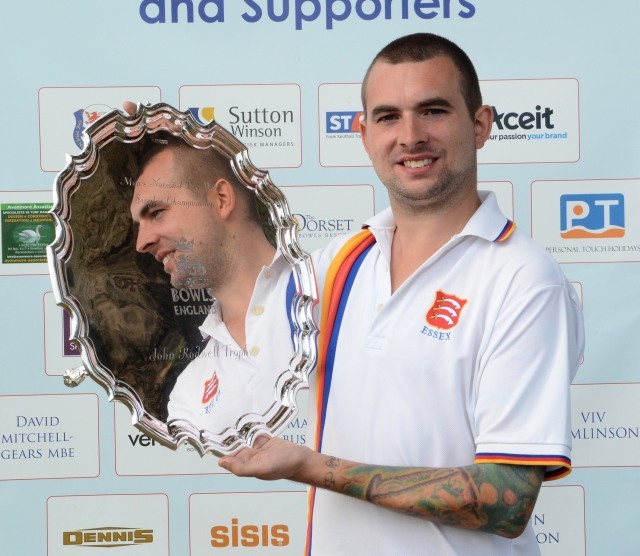 Brilliant atmosphere throughout the game which we managed to lose by 9 shots 92 – 101. Green bowled very well, on rink 5 anyway with Margaret Morris, Alan Parish helping Jane Taylor and I get top rink. 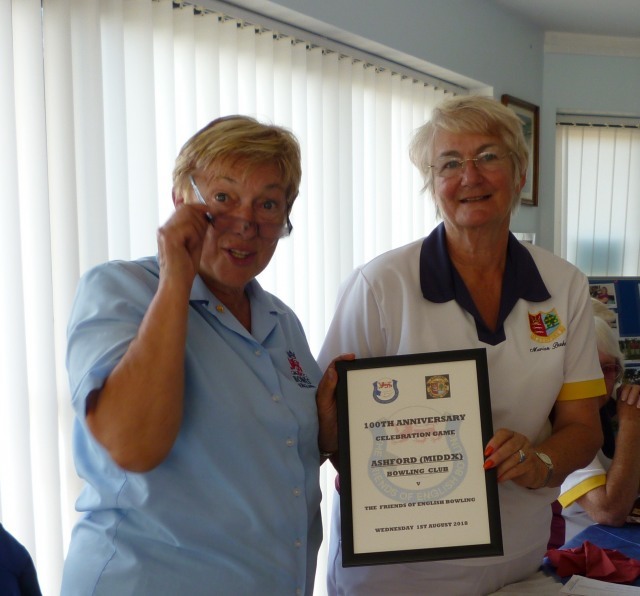 Top rink for Cambridge Park was Bernard Chapman, Coral Canard, Nadine Mullins and Jean Staples. Nice to see so many of the club’s top players in a mistake week friendly. 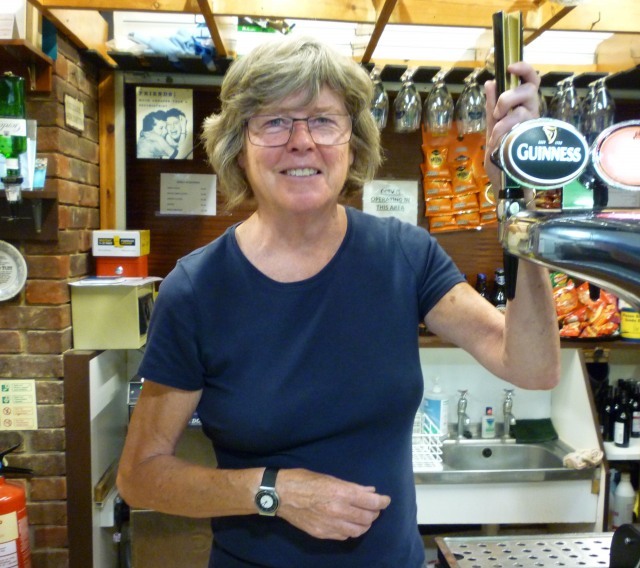 Jane (don’t take my photo), who looked after our thirsty needs all day. Before and long after the match. 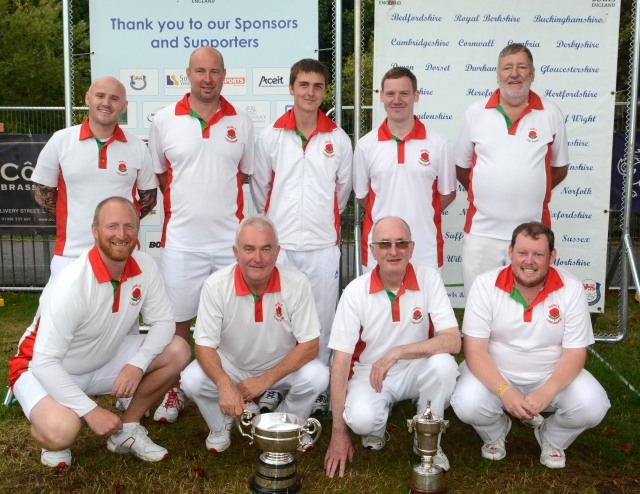 The Friends v Ashford B.C. Another sunny and hot day to enjoy. We arrived at Ashford to be greeted by President Marion Bushnell and a banquet layout for our lunch. Thank you it was all very much appreciatedby all the Friends. Some had travelled some distances to Ashford from 12 Counties namely; Beds, Berks, Bucks, Essex, Hampshire, Herts., Kent, Northants, Oxon, Somerset, Surrey and Wiltshire. Once refreshed and with the arrival of the club bowlers we made our way to the green. 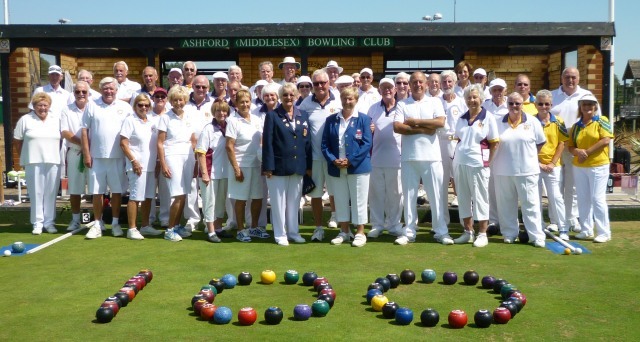 Bowls were grabbed from around the rinks to make a very large and colourful 100, and then we all posed behind them for the cameras. Rinks were announced and before the start of the game we spread around the green, one foot in the ditch for the charity spider in aid of Diabetes UK. 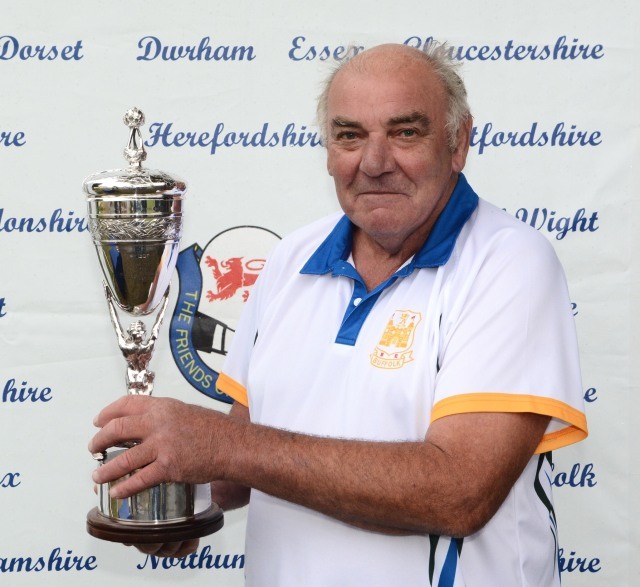 The winner was the Ashford Club Champion, Colin Staples, whose father before him had been Club Champion (now it gets spooky) and his father before him had been a Founder Member and yes you’ve guessed it, had also been Club Champion. 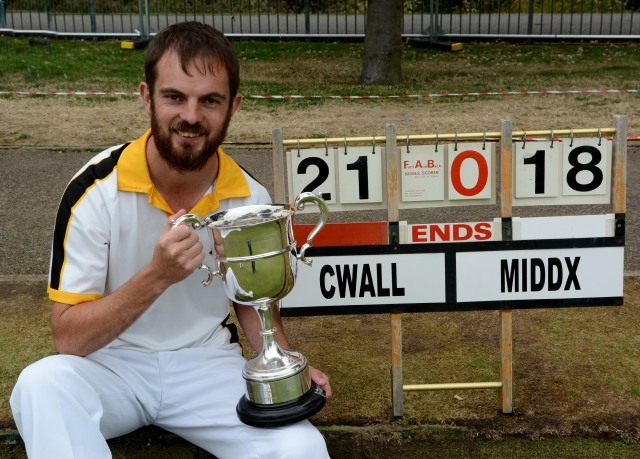 This wasn’t the first time he’d won the spider either – he’d achieved that at the Bowls England game too. Granddad must have been guiding the bowl! 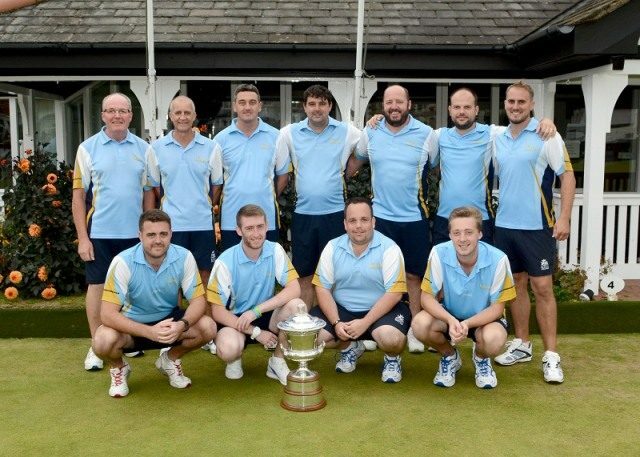 Two clubs, Egham & Staines had provided a guest rink each and they played in their club colours. 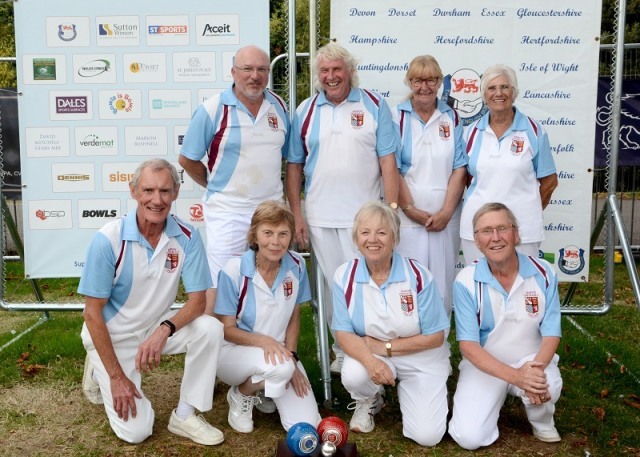 Staines bowling club are looking forward to their 100th Anniversary next year so an invite to the Friends for a match may well be on its way. After the downpours of the weekend even the home players were struggling to get up the green. President Marion had decided on a game starting with trial ends and then playing 18 ends. There was the usual banter and joking across the green typical of our games. It’s nice to get the win but it’s really all about enjoying the day and leaving your hosts feeling that all their efforts have been worthwhile. 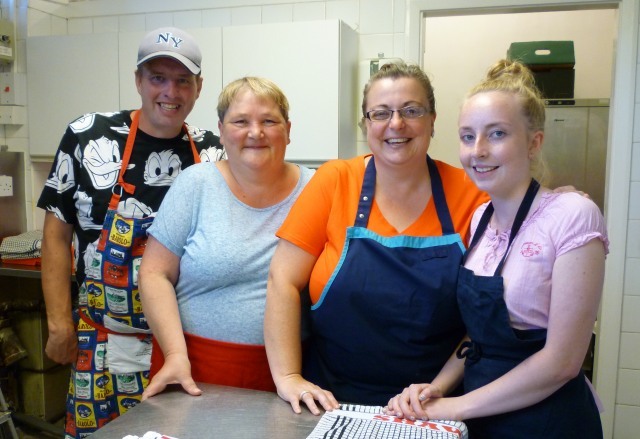 Marion disappeared after 10 ends to supervise the meal preparation and we continued with her replacement to a well deserved draw. 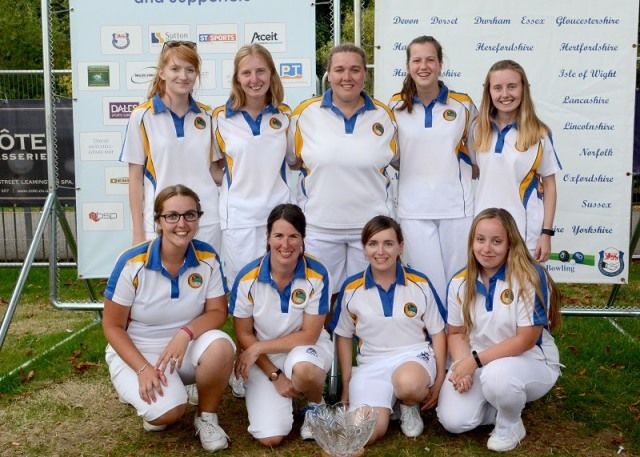 The results were 2 wins and a draw to us and 3 wins and a draw to Ashford. President Marion claimed the win from that score line but I did point out if we adopted MC or JT scoring she had to give us another 10 points for the overall score so the Friends actually claimed the win. Marion gave a very good resume of the Club’s history reading out snippets from a book produced for their 50th Anniversary. 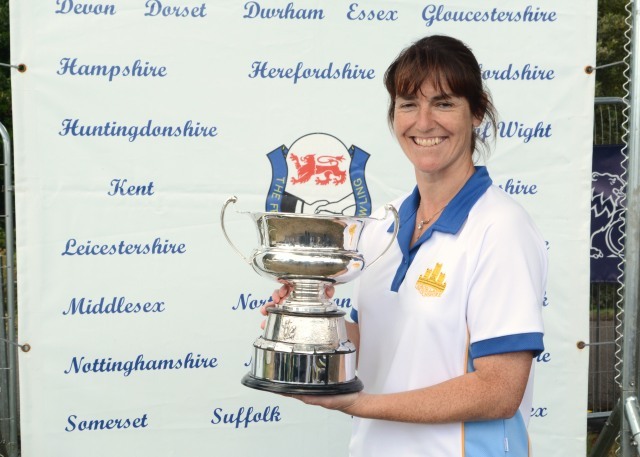 The Club Champion turned out to be Marion’s cousin and her mother and aunt had both been County bowlers in their time. 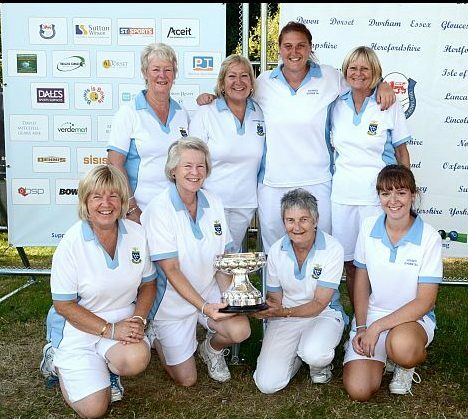 Over the years the Club had provided 5 or 6 Middlesex Presidents including Marion, who subsequently went on to be National President in 2003 and has been the Sponsor of the Women’s Junior Pairs since 2004. It had been a splendid day for all of us, ending with lots of raffle prizes and a journey home. Not so for our host. 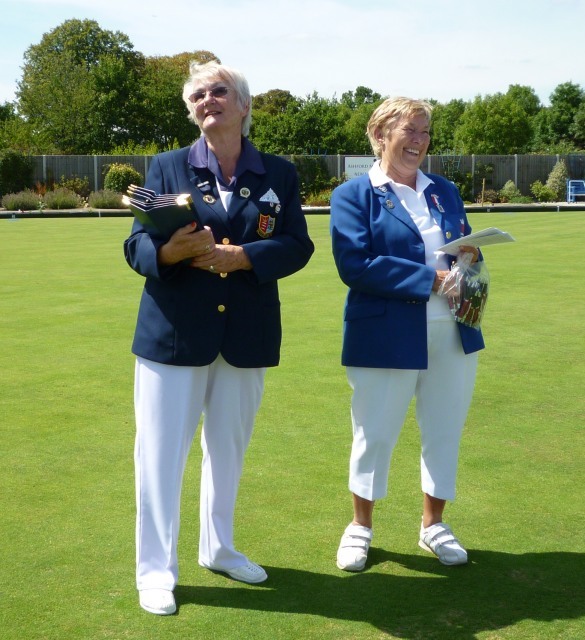 Marion and partner Carole, after being on their feet all day, were going to the green to play a District Pairs…. Totally barmy! ps. They won 20-15 and finished in the dark. Match Result was FEB 106 and Ashford 97. Staines four was their top rink and ours was Gordon Newman, Cyndy Lee, Michael Morris and Mick Skerry.